Haig Construction has done two major renovation projects and a number of other home improvements for us over the past three years or so. The attention to detail and care that they bring to the work is exactly what I needed as a "newbie" in remodeling and renovating our home. We had both the bathroom and kitchen (most recently) completely re-done. I have appreciated their regular communication and updating and the ease of reaching them with questions. Good communication is second only to the quality of the workmanship for me and I have not had any problems with contacting Mr. Haig. When appropriate, he'd be at the house to check into an issue (for example, a surprise leak early in the bathroom construction where the venting was to go brought him over immediately to examine the situation and offer an immediate solution). I also was able to turn to Haig Construction for advice about materials, colors, etc., when I was uncertain and needed to make a selection. 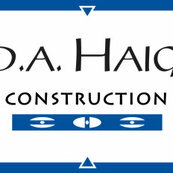 I would highly recommend Haig Construction. They do beautiful work.